A lot has been accomplished as of this newsletter. Power is on, light fixtures and fans are installed. Inside walls are completed and painted. Bathroom and Wudhu areas are tiled. 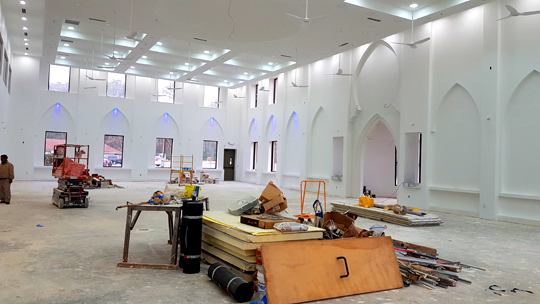 What remains are finishing touches including bathroom and kitchen fixtures, appliances, cabinetry, carpeting, flooring, and elevator installations; sprinkler, security, and audio-visual systems installations, old Masjid demolition and replacement with garden and pathway to the main gate. As of Jan 18, our combined account balances equal $56,500. We can open the new Masjid to the public by as early as April if - together - we can raise $262,000 between now and then.